CultureGrrl pontificated, but Herbert Riband, vice chair of the board of the Pennsylvania Academy of the Fine Arts, made some news during his broadcast stint this morning, preceding me as a guest on Radio Times with Marty Moss-Coane. 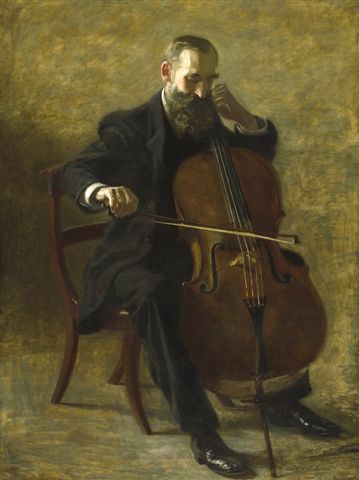 Riband revealed that the identity of the purchaser of Eakins’ “The Cello Player,” which his institution precipitously sold last week for “many millions of dollars,” is “unknown” to his institution. PAFA sold its major Eakins to help defray the cost of “The Gross Clinic,” after its $68-million fundraising campaign, undertaken jointly with the Philadelphia Museum, fell significantly short. Riband’s description of the deaccessioning decision as “a long and complex process” is belied by his own admission that deliberations over this deplorable disposal began at the end of December, when it became clear that the two museums would miss the fundraising deadline. He said that one of the factors taken into consideration in deciding what to sell was “the role of those paintings in the overall collection” as well as “what they might fetch.” If you look at the five other Thomas Eakins paintings reproduced on PAFA’s website and compare them to “The Cello Player” (above), it’s clear that the latter criterion (market value) outweighed the former (importance to the collection). Riband noted that the amount pledged by donors so far, about $37 million at last report, consists of “some cash, some pledges. It’s different to have a dollar in hand.” He also indicated that it was more important for the museum to reduce the “significant ongoing cost” of the loan offered by Wachovia Bank than to hold onto its signature Eakins. In other words, it is desirable to diminish a temporary debt, even if that means seriously diminishing the permanent collection. Part of the problem with this fundraising drive is the failure of the two museums to provide continuing updates about the amount raised, as a spur to donors who might be interested in helping them reach their goal. At this writing, the Philadelphia Museum still says on its website that “nearly half of the $68 million required to purchase the work has been committed,” despite the fact that its director of media relations told me, even before the lucrative sale of “The Cello Player,” that $37 million had been raised. The stated willingness of the anonymous buyer to loan “The Cello Player” back to PAFA on occasion is admirable. The extreme haste and secrecy in which this transaction was conducted is not. We have to take Riband’s word for it that the buyer is not Alice Walton, who had made the joint $68 million offer (along with the National Gallery, Washington) and is not anyone who would have any conflict of interest in buying the painting (such as a PAFA board member, for example). Riband in turn is relying on the word of the intermediary in the transaction, since he freely admits that the identity of the buyer is unknown to PAFA. The guest who followed me on “Radio Talk,” law professor Stephen Urice, argued that PAFA’s sale of its Eakins complied with the deaccession guidelines of the Association of Art Museum Directors. If that’s technically true, it’s only because AAMD’s list of six appropriate rationales for deaccessioning (none of which apply to “The Cello Player”) is silent on the crucial question of whether (and under what circumstances) it is appropriate to sell an important museum-quality works in order to trade up. That silence should end. Recent events have proved the urgent need for this question to be forthrightly addressed by AAMD: Is the permanent collection really permanent, or is it a liquid asset that can be used to empower curators as art-market players in this world of money-no-object collectors? That’s a loaded question. And you already know where I stand: Philadelphia’s “victory” in acquiring “The Gross Clinic” is as hollow as “The Cello Player’s” musical instrument. If you want to hear the entire deaccession discussion that aired this morning on WHYY, Philadelphia’s public radio station, you can access it on the station’s website here (Feb. 5, Hour 2). Or listen to the podcast here.